ATHENS, Ga—Georgia legislators are brewing up new legislation that, if passed, would revolutionize Georgia’s craft beer industry, according to some analysts. The legislation, Senate Bill 85 would remove the decades-old law that requires breweries to sell their beer through distributors and give away their beer on tours. Beer accounts for more than $1.1 million of Georgia’s economy and ranks 48th in the nation. Three of the 34 craft breweries in Georgia are located in Athens, according to the Georgia Craft Brewers Guild. They include Terrapin, Southern Brewing, and Creature Comforts. Under current Georgia law, breweries are not able to sell their beer directly to its customers. Instead, they have to sell their beer via a three-tiered distribution system: — first, they sell their beer to a wholesaler; The wholesaler sends it to a retailer. Then the retailer can sell it to a customer. SPECIAL NOTE: Georgia has the fourth-highest state excise tax on beer in the nation. Many Athens-area brewers believe that the current Georgia law stifles their growth because they are required to abide by staunch regulations and have to work through middlemen—distributors. 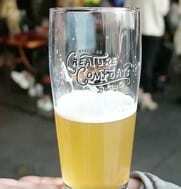 Furthermore, the current Georgia law has a clause that allows brewers to give away beer to anyone who purchases a tour. “Craft breweries in Georgia will be able to become more competitive with other craft breweries outside of Georgia if Senate Bill 85 passes.”, says Georgia Law Review writer, Charlie Suessmith. The Georgia House Committee favorably ruled on Senate Bill 85 and will be voted on by the Georgia House of Representatives in the coming week. If passed, Senate Bill 85 will go into effect by September 1.